Monday June 1st 1896 It was a cool pleasant day and I worked out in the yard all the time I could spare from my house work. The boys are plowing corn. It is nine years today since Ott & Fannie were married. 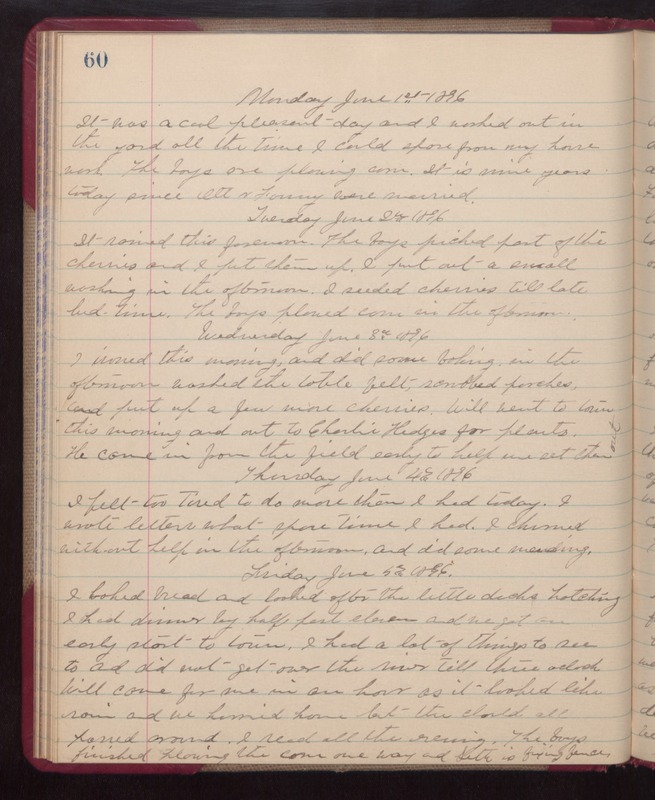 Tuesday June 2nd 1896 It rained this forenoon. The boys picked part of the cherries and I put them up. I put out a small washing in the afternoon. I seeded cherries till late bed-time. The boys plowed corn in the afternoon. Wednesday June 3rd 1896 I ironed this morning and did some baking in the afternoon, washed the table felt, scrubbed porches, and put up a few more cherries. Will went to town this morning and out to Charlie Hedges for plants. he came in from the field early to help me set them out. Thursday June 4th 1896 I felt too tired to do more than I had today. I wrote letters whet spare time I had. I churned without help in the afternoon and did some mending. Friday June 5th 1896 I baked bread and looked after the little ducks hatching. I had dinner by half past eleven and we got an early start to town. I had a lot of things to see to and did not get over the river till three oclock. Will come for me in an hour as it looked like rain and we hurried home but the clouds all passed around. I read all the evening. The boys finished plowing the corn one way and Seth is fixing fences.